At this point in the visit I am supposed to go on about the weather, and how Essex is such a dry county…" Steve Osborne looks out of the windscreen and raises an eyebrow. As if in response, the rain – which has been lashing down from the moment I arrived at Maldon station – intensifies, pelting the windscreen with an almost vindictive level of force. "Usually the southwesterly winds coming up through the UK from the Atlantic hit Ireland and the South East coast, condense, and are relatively dry by the time they reach us," he continues." That's why this area proved so popular with our good friends the Romans." As managing director of the Maldon Salt Company, Osborne has good reason to be interested in the weather here. 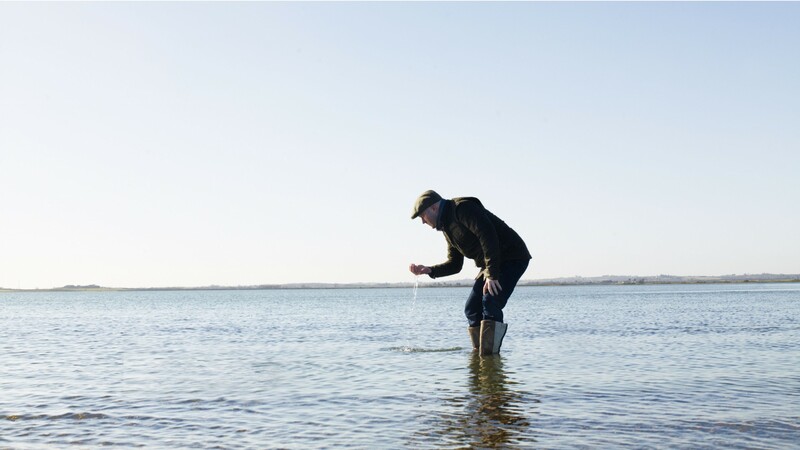 He explains that the climate was favourable, the land flat, the route to London relatively quick and easy – and the intricate ecosystem of tidal marshes perfect for the production of one of the area’s most valuable commodities: its sea salt. We look out onto the marshes: drenched and swathed in mist, the rising tide lapping inexorably at their edges, it wouldn't take too active an imagination to see a Roman settler picking his way across the marshland. 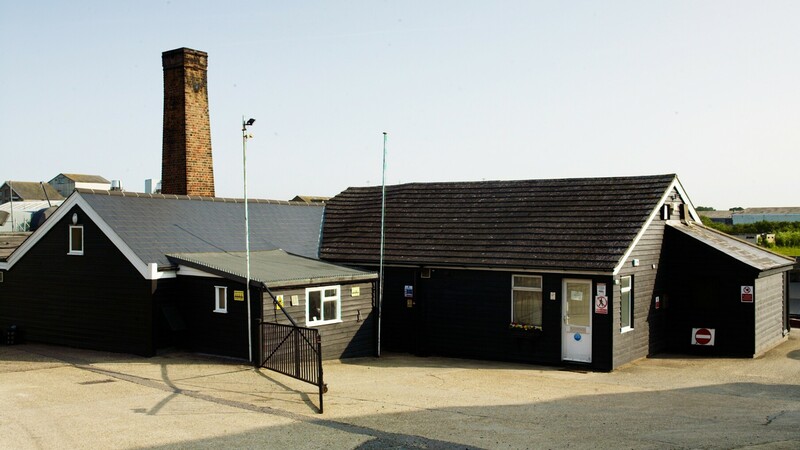 The Maldon Salt Company as we know it was established in the 19th century, but salt has been produced here long before the company started trading under that name in 1882. "A thousand years ago Romans and Saxons would cut into the sediment of the marshes and line the shallow pans with clay to stop it from falling in or vegetation from growing back," Osborne explains. The water would flood the pan at high tide, and the vegetation – sea grasses, sea kelp, seaweed and so on – would act as a natural filter and a crystallizer, with traces of salt remaining on the vegetation as the tide receded. "Just as when you go in the sea and the sun dries you off so you get a layer of salt on your skin, so this is what happens on the grasses. It makes the water at the higher level of the marsh more saline, as those crystals dissolve and recrystallise with the next tide." The early salt makers would collect this water, boil it in clay pots until it evaporated, and smash the pots to get the salt out – leaving in their wake mounds of clay pots and pot ash which, centuries later, have formed small, reddish mounds that are dubbed by the locals as the 'Red Hills of Essex'. Fast forward to 1086, and salt making in the region is big business. That year the Domesday Book records 45 salt pans in Maldon, and hundreds more scattered throughout the county. By this point, methods had advanced to boiling the water collected from the reservoir in what were called 'leddies': "lead pans into which the water from the reservoir was continuously added to create a strong brine through the process of evaporation – the basis of what we’re doing here today." 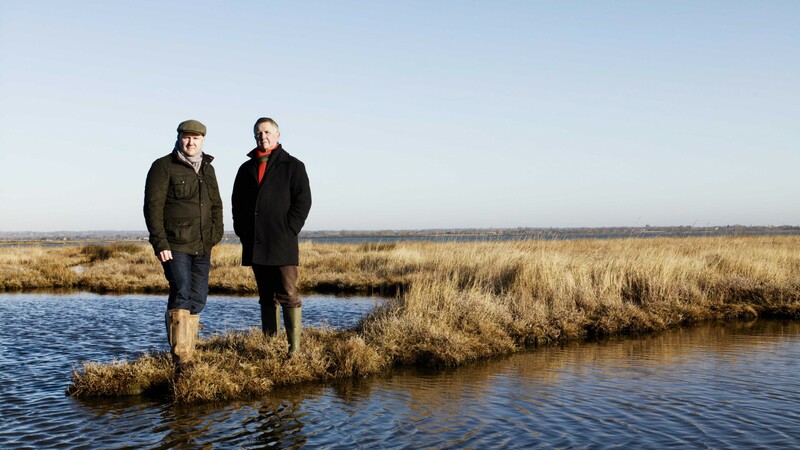 Steve is the fourth generation of the Osbornes to be coaxing salt out of the saline waters of Maldon’s marshes: his great grandfather purchased the Maldon Salt Company from a local wine merchant in 1922 and the rest has been family history. Yet while their reputation was strong in those early years, with custom from Harrods (who wrote to say they "found the salt much better than ordinary salt for pickling beef… and also gives the beef a much better flavour"), Fortnum & Mason and other high-profile clients, it wasn’t until Steve’s dad Clive assumed the reigns in the 1970s that Maldon went from Harrods to household. "Dad came from a commercial background. He developed the business to meet food-legislation standards, taking us up to a class where we could sell to supermarkets and export." In 1977, Her Majesty the Queen got her first delivery, courtesy of Clive Osborne himself. “We were granted our Royal Warrant in 2012, after the Queen visited the saltworks in 2010,” says Steve proudly, but it was for Her Majesty’s Silver Jubilee that his dad hand-delivered a box to Buckingham Palace. The rise in exposure at both ends of the market scattered Maldon into the hands of an increasing number of chefs, buyers and others in the food industry – all of whom were struck by the crystals’ unique crystalline structure and taste. We turn away from the marshes and, windscreen-wipers squeaking, make our way to the saltworks Steve’s grandfather bought almost a century ago. Little has changed as far as the eye can see: the hot, steaming pans are the same (though there are more of them than there were in Osborne senior’s time); the thousands of gallons of seawater are still taken according to the lunar cycle, when the tide submerges the saltmarshes; and the craftsmanship remains one of experience, manual labour and skill. "This is Gary, our longest serving salt maker. He’s been with us 25 years," smiles Steve, as Gary downs his long-handled rake and holds out a hand. "My uncle worked here 20 years before me – we worked together for 20 years until he retired and I took over – and I met my wife here. Oh, and my sister worked for 20 years in the packaging department!" Gary laughs, picking up his rake again and drawing great, glimmering mounds of salt to the edge of the pan to be shovelled into a large plastic bin. He makes it look effortless, as if the salt were snowflakes rather than solid crystals – yet when he hands the rake to me encouragingly, it takes all my strength and weight to move it a centimetre. "We’ve encompassed green technology, in terms of heat recovery systems, cleaner fuels, energy efficiency and so on – but this is still a hand drawn, handmade product. You can’t do it by machine." Gary knows what he is looking for. 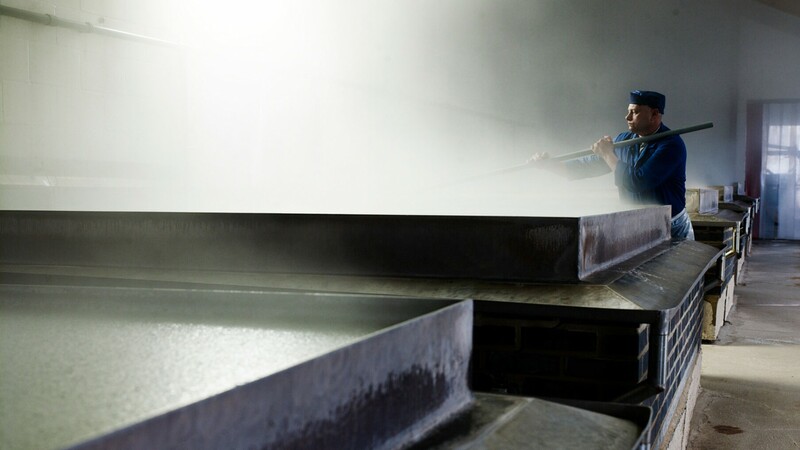 "We bring the water to a galloping boil to remove the impurities, then reduce the temperature until salt crystals start to form on the surface. It’s the surface tension on the water that creates the unique shape of our salt crystal, because as sodium chloride grows as a seed it bends the meniscus in a pyramid." Steve points to the adjacent pan, and I peer through the steam rising off the surface to where the ghostly shadow of a crystal is slowly materialising. "Once it gets to a certain weight it breaks the surface tension of the water and falls to the bottom and sinks." It’s mesmerising: like watching the clouds in the time-lapse shots in a David Attenborough documentary, appearing then disappearing again. Crystals seed, grow, and fall to the bottom, sometimes singly, but often in misty blooms. "Once he sees the crystals are forming as they should, Gary will set the temperature and regulate it accordingly. He knows the size and shape that he wants, and the necessary temperature at different stages." "We need to make sure that we are yielding the right amount in the right amount of time, and conforming to quality standards," Gary points out. "There’s only two of us in the factory, so it’s a challenge every day to get the work done – but I enjoy it enormously. People are always interested in what I do." Maldon is not a big company: in fact, in relation to its global market, it is tiny – a mere 45 people all told – but what it lacks in size it more than compensates for in skill, passion and the knowledge of generations. "It's not just my family and Gary's family – Maldon Salt Company has touched the families of all the local people we work with. The family business which helps us manufacture the salt pans, the local welders and steel fabricators – all these people have worked with us for decades, longer even, and know just what we need." By extension, Maldon Salt Company is an important source of local employment, and of pride for the people who live and work in the area. 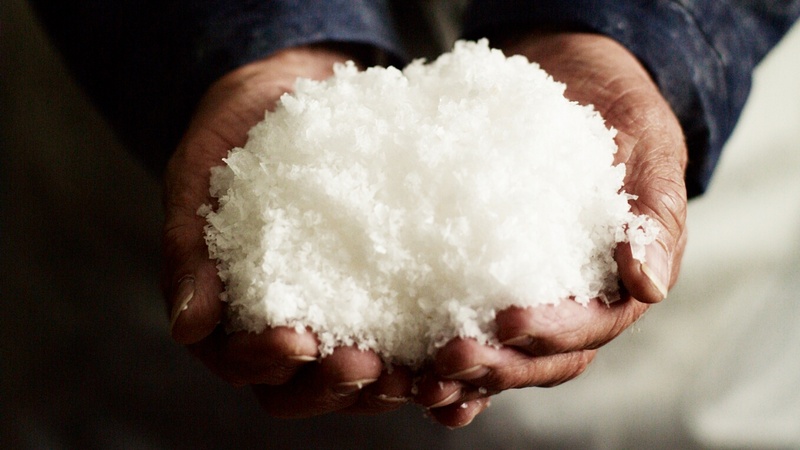 "It's a source of real pride amongst our employees that they are producing an internationally recognised, gourmet product; that this salt you see here could end up on a Michelin-starred plate in the States or Australia. 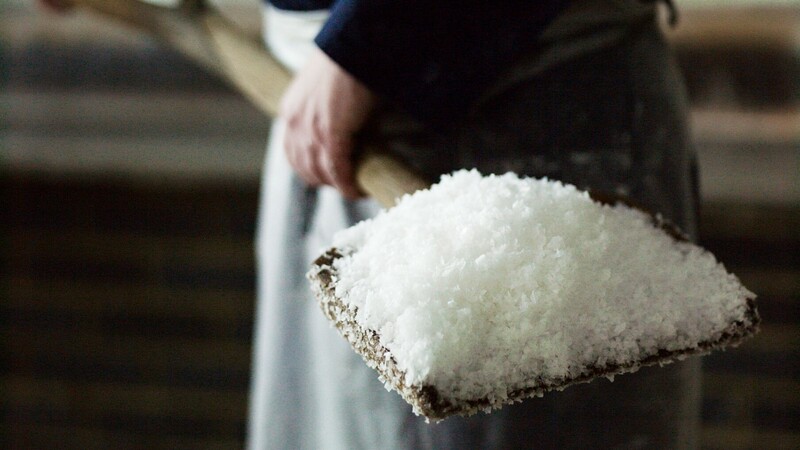 We're delivering the best salt in the world to the best chefs in the world," Steve says glowingly – not to mention, he adds, the legions of enlightened home cooks who use it, too. We move on to the drying room, where Thomas is drying the previous yield, and I’m struck by the change in atmosphere: from steam room to sauna. "Salt is hydroscopic. It absorbs moisture," says Steve, "which is why industrial salt makers will add anti-caking agent to stop it congealing." It's the same reason you find rice grains in salt shakers – at least, those salt shakers not containing Maldon Salt. Though they take great care over the drying process, using a bespoke drying machine to blast the crystals with hot air ("a great improvement on the old hessian sack and wood-burning stove method," Steve smiles) when it comes to the product, think Tropicana – or at least what Tropicana claims to be: "there is nothing added to Maldon salt, and nothing taken away." He gestures toward the dry crystals vibrating gently into the waiting sack. "This is the finished product. That's now ready to be inspected and packed." It's transported by vibration, he continues, because the delicate nature of the crystals mean they could break up were they conveyed by the conveyer belt. The culinary significance of this unique structure cannot be overstated. The crystal's thin pyramid shape means its flavour "spreads over the tongue, so it's not as hard and intense as regular salt. The texture is softer, and the magnesium content in our salt is relatively low: it's magnesium that makes salt bitter" Steve continues. This, along with the easily dissolved structure is why Maldon is a good cook's go-to. "When I say butter I mean unsalted, and when I say salt I mean Maldon sea salt," instructs Nigel Slater; Nigella Lawson, meanwhile, has a tin of Maldon and a sachet of Colman’s mustard in her handbag. There are other posh salts of course – those harvested on the salt flats of France and Portugal, but salt formed from the evaporation of sea water via the sun does not form this shimmering pyramid shape. "It’s heat from above as opposed to beneath the water," Steve explains. "The brine crystallises in the sun, and creates a crust which the producers scrape off and grind down to specification." 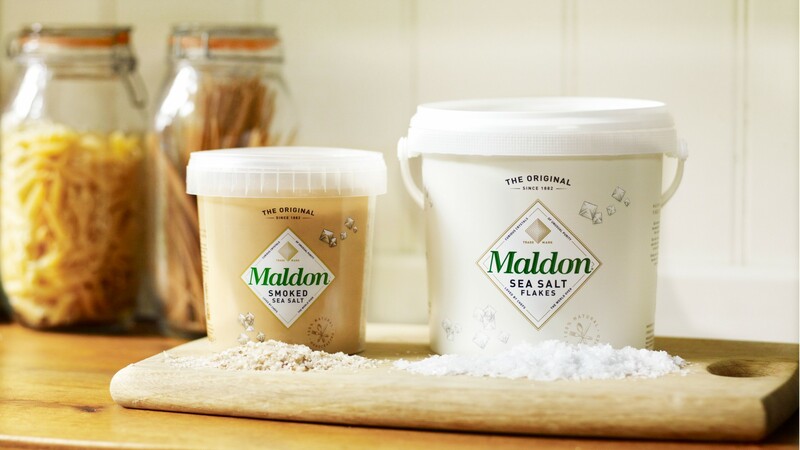 It’s still better than refined table salt: sea salt and rock salt retain valuable trace elements such as zinc, potassium and calcium, which are stripped out in the industrial refining process – but Maldon truly is unique when it comes to structure and, by extension, taste. Needless to say, it's not competition that keeps Steve awake at night. I’d assumed Maldon sea salt would hold Protected Designated Origin or Protected Geographic Indication status, but Steve says it's unnecessary. "Anyone trying to make salt here would find it difficult. We've the trademark registered, and the rest would just be more paperwork and more lawyers' fees." You couldn’t recreate Maldon, he continues – even if you were to set up in Maldon itself. "It's not just the area, it’s the production technique. The pans, the brick flue structure underneath the pans, the control of temperature and timing – these are the family manufacturing secrets of generations." Maldon Salt Company moves forward: there's a bespoke packaging and inspection building; the coal fires have been replaced by clean-burning fuels; it's encompassed green technology in the form of heat recovery systems. But its foundations are thousands of years of saltmaking, and a home which, like Bakewell, is synonymous with the product. It's meeting demand, not creating it, that keeps Maldon busy. I head back to the station, the weather hell bent on making a mockery of Steve’s metrological assessment – but I don't need the sun to shine for proof of this area’s qualifications. I’ve got a packet of Maldon sea salt in my satchel, and it is crying out for the fresh, gleaming slipper of mackerel that’s sitting in my fridge. I grill it with chermoula and salt, as per Paul Gayler's suggestion – the executive chef of the Lanesborough is another champion of the brand – and tuck in eagerly to a holy trinity of tastes and textures: rich, oily flakes; the bright, fragrant tingle; and, underpinning it all, the whispery, crackling saline echo of history, craftsmanship and the sea.